For using Yashica/Contax cameras (FR, FX-3, 109MP, S2B and others) with M42 lenses (Praktica, Zenit). Delivery set: the adapter ring, and the wrench for setting the adapter. 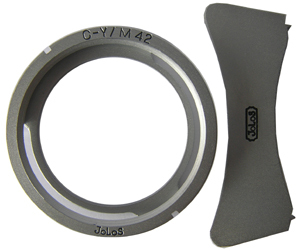 M42 lenses are completely interchangeable with Contax/Yashica optics, as they have the same flange base. You should remember that the pusher with the fixed ring doesn’t work, so diaphragm control of the lens is set manually. This adapter can work with lenses having both only automatic diaphragm (A) and selector A/M (automatic/manual diaphragm). It is possible to use Macro rings and other accessories. Put little groove of the adapter and the red mark of lens collar together. Turn the adapter clockwise till the fixative click by the wrench. Press stop button on the camera, turn the adapter anticlockwise by the wrench.